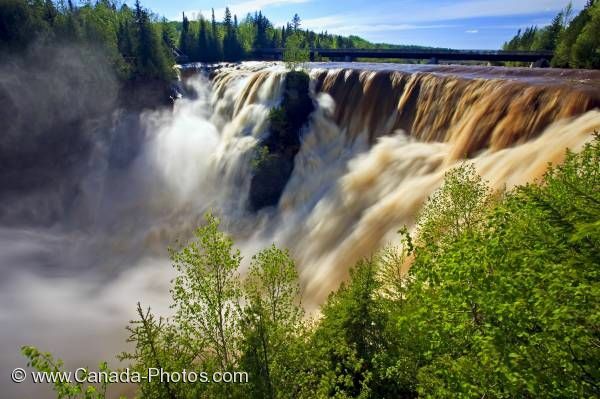 The spring flood reveals the power of the forceful Kakabeka Falls in Kakabeka Falls Provincial Park. The appealing falls are a beautiful watery blur. The falls cascade down the rocky ledge of the Kaministiquia River into a cloudy mist. Evergreen trees are along the shoreline of the river. The beautiful misty Kakabeka Falls cascade over the sharp ledge of the Kaministiquia River, Thunder Bay, Ontario.